In a 1959 stunt only slightly less cartoonish than our Air Force's harebrained flight of its atomic airplane1 our navy and post office landed a Regulus I missile at the Naval Auxiliary Air Station, Mayport, Florida carrying about 300 "rocket mail" postcards. 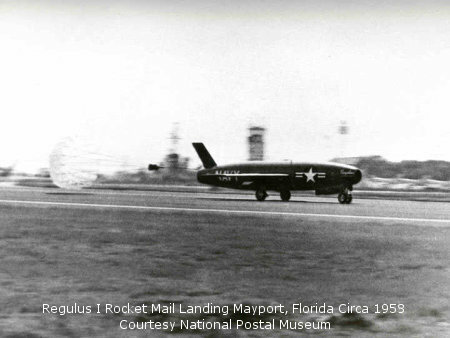 A postcard, postmarked USS Barbero, SSG-317, June 08, 1959, which launched the Regulus I missile was delivered to President Eisenhower by postal carrier Noble Upperman. The merits of programs may be inversely related to the magnitude of the staged stunts supporting them—"rocket mail" went nowhere after the initial staged stunt. Although, the postmaster general's goal of speedy delivery has been realized—electronic letters speed around our globe in milliseconds while the post office scales back its delivery services.